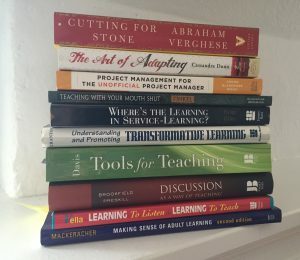 This first year I worked in a post-secondary setting, I was somewhat bemused when students asked me how I was going to spend my summer – they were heading out on a three or four month “break” and assumed I was doing the same. Some had work plans, some travel, some both. Regardless, they would be away from campus and recharging their batteries, and, perhaps, expanding their perspectives in a variety of ways. I, however, would be at my desk. Two decades and three universities later, I’m still working through much of the summer months as are many of my administration, staff, and faculty colleagues as we stagger vacations with other colleagues and other family members’ schedules. For those of us at the School of Medicine (including our 2018 clerks!) who don’t have two or three months off this season but maybe a couple of weeks and the odd day here or there to make a long weekend – here’s my list of five things to do that are (loosely) related to medical education. (This list is best perused—and perhaps amended or augmented—while sitting on a patio with your favourite libation). In the crush of academic terms, it’s easy to fall into the trap of reading for work, not for recreation. There’s always just one more journal article to be read, one more new text to review. One more thing to stay on top of. Vow to read at least one novel (or collection of short stories, or poetry) this summer. Regardless of genre, you’ll learn something of the human condition (which is at the heart of medicine and medical education) and it will refresh you, too. So, move it to the top of your To Be Read pile. Among my picks: a toss-up between finally reading at least one of the Harry Potter books, or Abraham Verghese’s Cutting for Stone. Maybe both. The Art of Adapting by Cassandra Dunn is also in the running. Whether it’s TiVo’ed or Netflix, the ability to skip the ads is a godsend for a rainy Saturday’s binge-watching. Opt for something where you might pick up a recipe or tip or two, but pay attention to how the host explains what they’re doing. Is it conversational? Directive? Do you stay engaged? 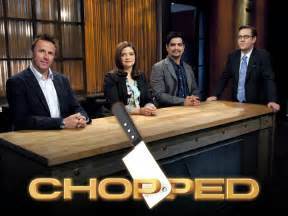 Or pick one of the competition shows (Chopped is my guilty pleasure) and check out how different judges give feedback. Some are brutal; some overly-kind without much substance. Some have thoughtful suggestions. Many adapt their critique delivery, based on the experience and competence levels of the chefs competing. How can this inform how you deliver feedback? Sandcastles are hands-on and best accomplished as a team effort. Building one requires both attention to details and a flexibility to accommodate the sand, water, and tide schedule. The plan is rarely ever 100% completed without modifications along the way. Plus, everybody gets dirty. And, at the end of the day, there’s nothing except pictures as the tide washes it away. So, a fresh slate the next day. And, we can take the lessons learned on to the next one. Enjoy the a/c and see something outrageous. Popcorn optional. 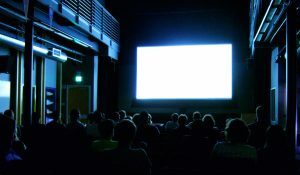 Take note of if the story drags anywhere: did you get the urge to check your smart-phone (pre-movie admonishments aside). What made your attention wander? Was it an extraneous info-dump? An overly-long car chase? Just too much of something? A gap in knowledge? If you’re working on online modules for next year, take note of where the show lost you. Adapt this insight to material you create for your students. 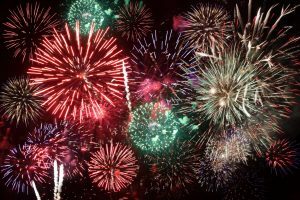 Most of us know that fireworks were invented in China centuries ago. According to the “Fireworks University” website, this was an accident when a field kitchen cook happened to mix charcoal, sulphur and saltpeter. What a happy accident*. There’s no great medical education insight to go with this watch fireworks suggestion: they’re just fun. And maybe that’s the insight right there. * (I feel obliged to stress the importance of following all instructions for the at-home kind of fireworks and strongly urging you to show up for community fireworks shows instead. Avoid the unplanned side trip to the ER). Next PostNext Is every Canadian medical school graduate entitled to become a practicing physician?